Pune 2nd Aug 2015: Stepping into Pakistan soil after breaking through the barriers on December 5, 1971 during the Indo-Pak Bangladesh liberation war, was the most thrilling moment of life, gallantry medal winner and senior Army veteran Lt Gen (retd) B T Pandit said here on Monday. Also present on the occasion were Air Marshal (retd) B N Gokhale, director, Centre for Advanced Strategic Studies, Pune and former Vice Chief of Air Staff and and Maj Gen H S Bedi VSM from Headquarters Southern Command among others. Sharing his experience of the 1971 Indo-Pak war Lt Gen Pandit said, "The 1971 war was the last full fledged war that India had although there have been many war like actions later but they were limited." He added that during this war around 93,000 enemy soldiers surrendered which was a big record. Never before in the world military history post World War II, 93,000 enemy soldiers surrendered before another Army, in any war front. But this extraordinary feat was recorded by the Indian Army in the 1971 Bangladesh Liberation War. "Pakistan started the war on December 3 and in 10 days we strangulated the enemy in Dhaka and Bangladesh was born on December 14. Also Pakistan accepted ceasefire and surrendered with most of its forces intact. At that time we felt extremely confident of our leader, Indira Gandhi," said Pandit. Speaking about the book, Lt Gen Pandit said that the book has been written in great detail in two parts with the first part more as an autobiography and the second part giving a detailed account of the war. Air Marshal Gokhale too complimented the book for its research and detailed description. "It is very lucidly written book. Having migrated at the age of 4, leaving behind the rich Zamindaari estate, the author's family had to reestablish themselves in Calcutta," Air Marshal Gokhale said. The initial half of the book though biographical reflects on this struggle, author's own ambition and efforts Lt Col Gupta Ray had put in to join the Army. "The book later describes in detail with maps and photoraphs his own operational experience in the West and Sector wise action in then East Pakistan," the former IAF vice - chief said. 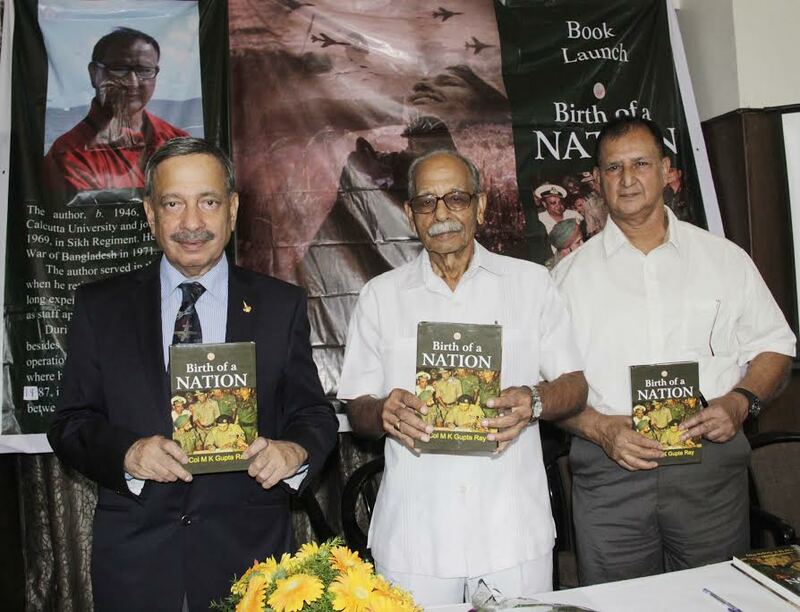 On the occasion Lt Col (retd) M K Gupta Ray said that the main reason for writing the book was that very few people from current generation are aware of the country’s glorious military history. He added that the 1971 Bangladesh Liberation war was perhaps one of the few battles fought in the annals of human history where a neighbouring country sent its troops to save a country from their demoniac leaders and give them freedom. “On 3 Dec 1971 India had sent her forces inside East Pakistan, part of a neighbouring state, to save the citizens (Bengali Muslims) from one of the most dreadful genocides, that was being perpetrated upon them by their by their own so called ruling class from West Pakistan (Non-Bengali Muslims),” Lt Col Gupta Ray said. “The young government and the Army accomplished this task with unprecedented efficiency. While the government under leadership of then Prime Minister Indira Gandhi with full political support and support of the millions of Indian stood like a rock against all world pressure and odds, India Army had accomplished its task with surgical precision,” the 1971 war veteran said. “The book, in quest of the genesis of this war, has dug into the history of the subcontinent ad narrated development of the events as it unfolded. The warring countries were once part of the same country before cruel hands of politics dissected it into two,” said the retired officer, who fought in the Baramulla sector of Kashmir in 1971.